Can you help with date or identify my Victorian chair. 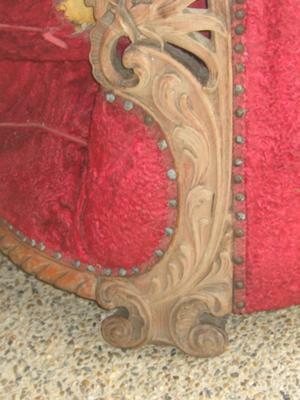 It is possibly an Antique Victorian Parlour Chair? A friend of my husband had recently purchased some property that had some existing structures on it, Sheds, Storage buildings, etc. 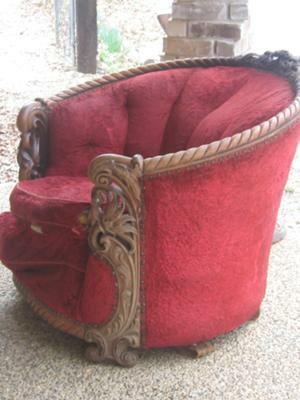 As they were emptying the contents they came across this possibly, Victorian Parlour Antique Chair. 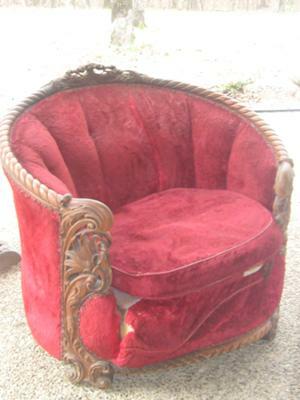 The new owner was going to throw it on the burn pile along with other trash and junk, but my husband told him that he would love to take the chair because he thought it was to pretty to discard. “May even be worth something“. It is a very interesting design, and the detailed carvings of the wood are very intricate. I have been unable to find any markings of any kind that may give clues as to the age of the chair or where it was made. I think it my be a Victorian chair? Possibly early 1900’s. As you can see from the pictures it is badly in need of repair. The upholstery is shot and the wood has little finish left on it. I do like the chair and would like to have it restored for our own use and pleasure. Any insight you may have on the best way to repair the finish of the wood, and where to find the best vintage upholstery would be nice.